This luxurious body butter contains a high percentage of cocoa butter and organic grade carrier oils. Cocoa butter is renowned for its ability to heal dry, cracked or sensitive skin, revealing healthier and smooth-texture skin that’s soft to the touch. It also boosts hydration levels, which revitalises skin. Cocoa butter is also contains natural antioxidants, which further heal and soothe burns, rashes and minor skin infections. 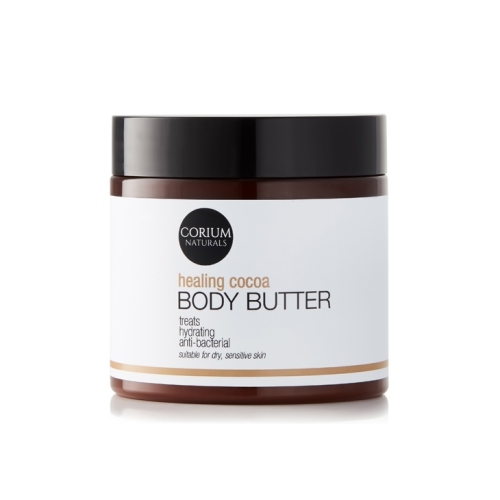 Healing Cocoa Body Butter is suitable for dry, problematic skin. Notify me when 100ml Healing Cocoa Butter Body Butter 200ml Healing Cocoa Butter Body Butter is available.